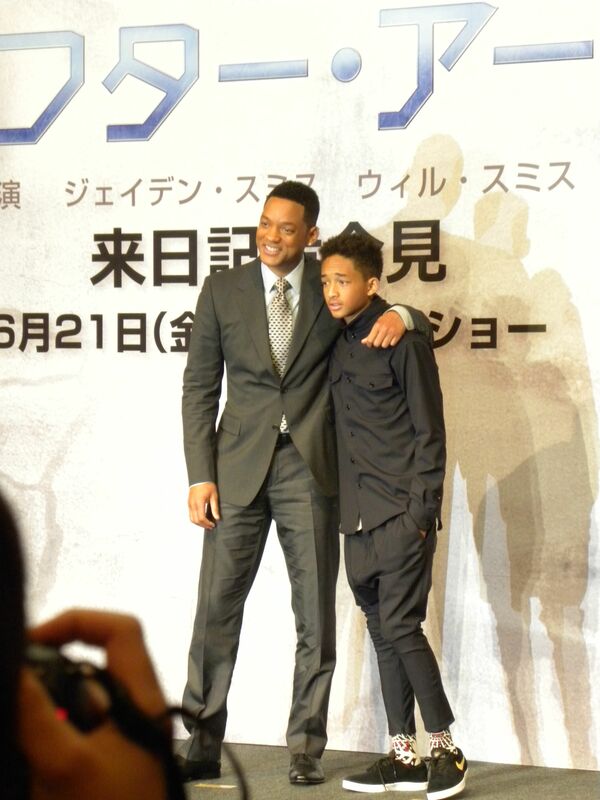 In his newest sci-fi blockbuster, After Earth, Will Smith plays a man who is incapacitated during a crash landing on earth some thousand years into the future and in order to survive he has to send his own son, played by his real life son Jaden Smith, on some perilous errand to retrieve a vital object through a landscape that has “evolved to kill humans.” Apparently, homo sapiens destroyed earth back in the 21st century and had to relocate to some other planet and earth isn’t looking to let bygones be bygones. At least that’s what I got from the 16 minutes of footage that was shown to the media prior to the press conference for the movie in Tokyo. It consisted of the two existing trailers spliced with three complete scenes from the movie. Smith is uncharacteristically stoical in the role. He treats his son as a soldier rather than his progeny, and that seems to be one of the hoary themes of the film, that these two will by the end learn to be father-and-son rather than commander-and-subordinate. That theme also carried over to the press conference, where the Smiths parodied their public image as a way of demonstrating that it wasn’t as serious as we might imagine. 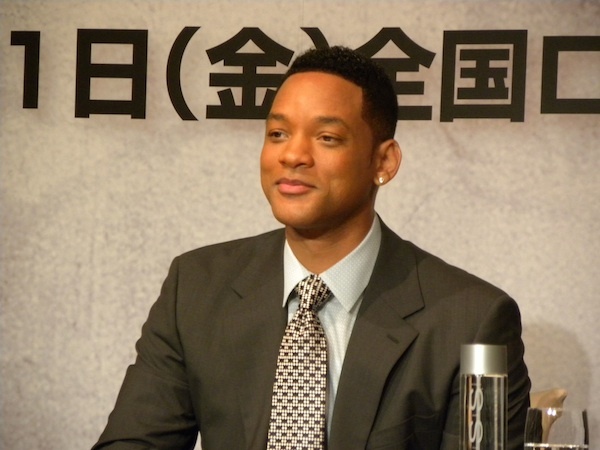 No one sells himself as a movie star as aggressively as Will Smith, not even Tom Cruise, whose self-image is so circumscribed that he seems to have every response scripted. Smith wants you to know how much he enjoys his job and isn’t scared to wing it if it thinks it will endear him to the people who count, and here the people who count were the Japanese press, delighted to be privy to his every awkward ad lib. With Jaden he had a practiced straight man, and while their forced-funny banter was diminished by the dry translating of the interpreter, the audience relaxed immediately and didn’t seem to mind the lack of substance and Will’s penchant for pointless hyperbole. One guy sitting in back of me was a little too relaxed, letting out a studied guffaw at every gag. 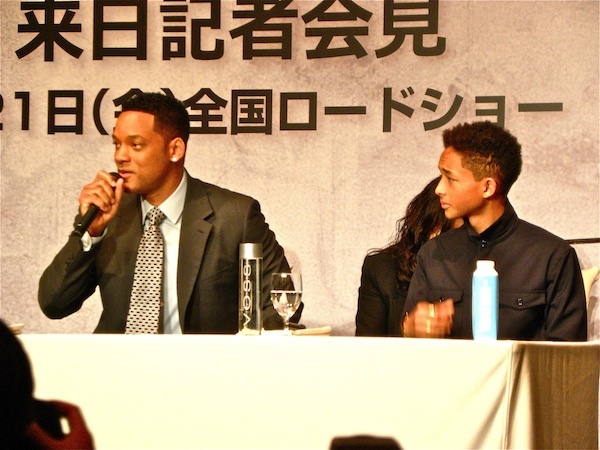 “About two-and-a-half years ago, Jaden was working on The Karate Kid with Jackie Chan,” the elder Smith explained in response to the first question, “and I saw how much fun they were having working together, and I was jealous. I said, ‘Jackie, that’s my son.’ So I started thinking about a project that we could do together, and it started out in the present day about a father and son, and then one day I just had the inspiration of putting it a thousand years in the future, and from there I called M. Knight [Shyamalan] on his birthday and he said, ‘I don’t want birthday wishes, pitch me a movie,’ and I was just in the middle of it and I pitched him After Earth, and he loved it from that point.” It should be noted that Jaden Smith, who is now 14, made his feature film debut as Will Smith’s son in The Pursuit of Happyness in 2006, so it’s not like the pair had never worked together before. Maybe Will meant that it lookd like fun to do a totally frivolous piece of Hollywood product, since Pursuit was more or less serious, being about homelessness and all. 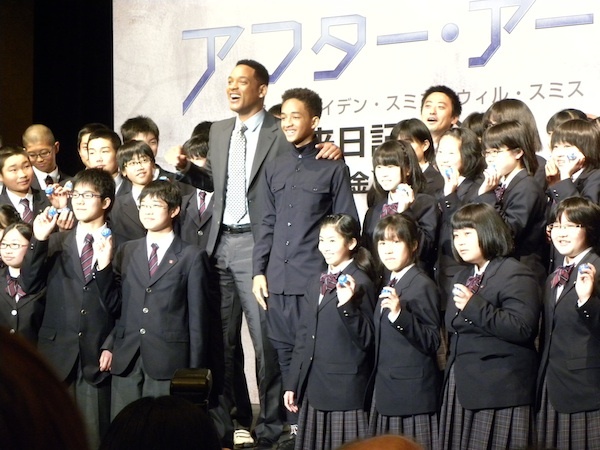 Jaden was honored more directly by Sony Pictures with the presence of several dozen junior high school students who had been bussed in just for the occasion. He jumped off the dias and ran over to the uniformed kids, high-fiving and hugging them, saying “how’s it going” in a loud voice that was spontaneous without being disruptive. He was learning fast from the master, and, in fact, one could often pick up a note of rivalry between father and son: Who would steal more hearts? More pointedly: Who would get the last word? “That’s good,” Will said, more impressed than the media, who couldn’t make the right connections quickly enough. But dad got the last word anyway. “I mean, I was there. And I got most of the money.” It was the big laugh he’d been looking for all along. This entry was posted in Media, Movies and tagged After Earth, Jaden Smith, M. Night Shyamalan, Pursuit of Happyness, Will Smith. Bookmark the permalink.